Owner: Grand Prix Adventures Ltd. Formed Grand Prix Adventures in 2004 having spent all of 2003 piecing the component parts of our packages together with hotel inspections, balcony visits to ensure the views were excellent and with transport companies to ensure we had quality partnerships. 13-years on, we still use the same balconies, have formed strong partnerships with the hotels we offer and have now expanded to offer Monaco, Silverstone, Monza, Singapore, Austin, Brazil and Abu Dhabi Grand Prix ensuring at all times the customer gets everything promised in addition to an award winning level of service. I love what I do and do what I love - a fortunate individual that my business thrives on dealing with like-minded people who enjoy motorsport. 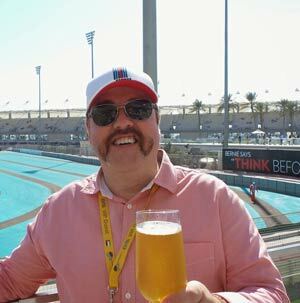 Grand Prix Adventures are the leading provider of hospitality at the Monaco, British, Singapore, Italian, American, Brazilian and Abu Dhabi Grand Prix. I run the business with help from a great team, some of them event based in Monaco and some at HQ in Dundee. Always offering a personal service and striving to deliver excellence all the times.